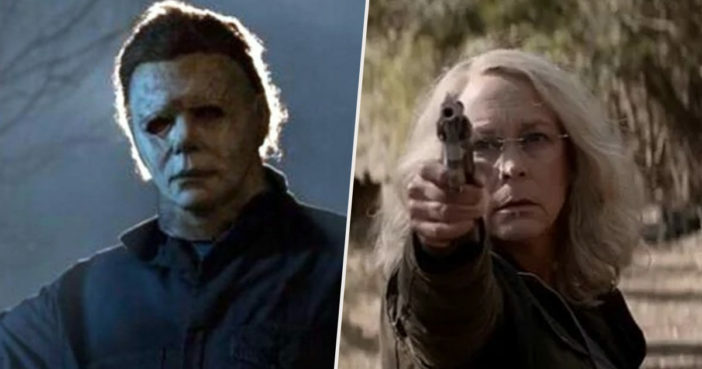 ‘He is a killer but he will be killed tonight.’ So says Jamie Lee Curtis’ most badass character Laurie Strode in the newly released trailer for 2018’s Halloween. However, it seems as though Michael Myers – returning home 40 years after he first tormented Laurie as a teenager – will take some beating. As eerily silent as ever, the ultimate slasher villain can be seen up to his old tricks; creeping around a pumpkin lit neighbourhood looking for prey. The trailer opens with an innocent scene of children out trick or treating; made sinister by the tinkling yet foreboding music. Two youngsters bump into a shadowy, quiet figure as they walk from house to house; unknowingly colliding with the embodiment of pure evil as their candy scatters on the ground. 40 years ago, on Halloween night, Michael Myers murdered three people. The masked villain can be seen grabbing a hammer from a garden shed; heading towards the house where he commits a typically atrocious murder. Time has clearly failed to temper Michael, who is as bloodthirsty as ever. Grabbing a knife from his victim’s kitchen, Michael heads back out into the seemingly peaceful neighbourhood; with the strong suggestion of further brutality to come. I have prayed, every night, that he would escape […] So I can kill him. Now a silver-haired grandmother, Laurie’s intense, personal hatred of Michael hasn’t faded one iota. As we watch her at shooting practice and lashing out about inadequate security systems, it’s clear she has never quite woken from the nightmare Michael put her through as a young girl. Could she be the one to finally put Michael six-feet-under? I can't wait to watch it!!! Those who have seen the trailer appear excited by the release, praising the stark similarities in style to the original and best film in the franchise. YES YES YES YES!! I’m honestly crying right now I just can’t wait for this film!! Every single thing I have seen looks inf*ckingcredible!! Ahhhhh gonna watch it at least 10 times the first week of release!!!! First trailer doesn’t even compare to this one. They did a fantastic job of showing the depth of the final showdown between Michael and Laurie, and how she will basically face him alone. This is FINALLY the sequel that we really, really deserved. Precisely captured the essence of John Carpenter’s classic. The original Halloween remains one of the tensest horror movies ever created, bringing us a villain who would haunt filmmaker’s imaginations for decades to come. This new instalment already looks set to be a worthy follow-up. You can catch Halloween in cinemas as of October 19, just in time for the scariest night of the year.